My friends Caiques have got out!!!! As I hope you're all aware my beloved babies Tinker and Polly have escaped from their holiday home. We're away in the USA and are now waiting for our flight, leaving early to help look. Please please I beg all of you if you know anyone in the area ask them to look for them. They're both friendly and tame and hopefully will come if someone calls and offers food. By now I'm sure they're hungry and scared. It's just over one year since we lost Harry while we were away. This just feels beyond bearing. A very good friend of mine is on holiday in the USA and they were at their holiday home, they are on a plane back now, early to look for them! 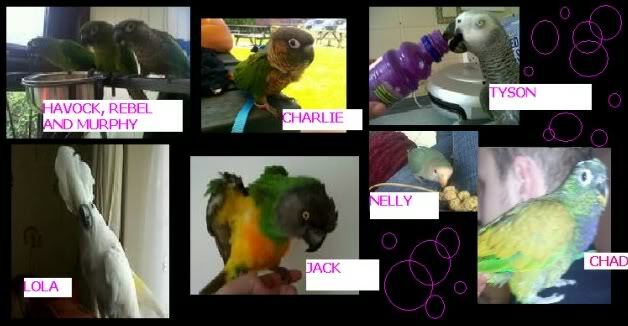 They were away last year and her beloved caique died while they were away! She is devastated! 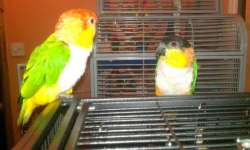 Re: My friends Caiques have got out!!!! Do so hope they are found. Please keep us updated as to the news if any. Good luck. Nooo all our worse nightmares. Please keep us up to date. I take it that John Hayward has has been given details? Local radio, schools & so on??? Yes, I think everything humanly possible is being done to find these two! Polly is only a baby, a couple of months old and Tinker is my Poppi's brother. Thanks Steve, think Net has landed and is busy making more posters for tomorrow, she is in Rotherham but no oubt will arrive first thing tomorrow. netnetster@hotmail.com or lloydan@lloydan.plus.com if you let her know you are close and can do anything for her! There have been a couple of sightings a few days ago, but nothing else. She has been out there from dawn to dusk, everyday, wishing them back safe and sound. They are in the Belper park area, I'm tryi ng to record my two screaming but everytime I get near to them they shut up!